﻿﻿Welcome to blackprintculture.com﻿﻿, the web home of Eric Gardner. 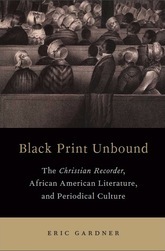 In the wake of my most recent book Black Print Unbound: The Christian Recorder, African American Literature, and Periodical Culture (Oxford University Press, 2015), I'll be using this site to share my on-going learning about early Black print culture, including the lives and texts of those involved in early African American print, with emphasis on how this learning can shape our contemporary actions. Images of Sarah E. Tanner, the AME Church Bookstore, the AME Church print shop, Jabez Pitt Campbell, and Mary E. (Ashe) Lee are from Richard R. Wright's 1916 Centennial Encyclopedia of the AME Church. The 1876 engraving of AME Bishops and key AME locations is housed in the Prints and Photographs Division, Library of Congress (LC-USZ62-15059). The image of Frances E. W. Harper is from her 1892 Iola Leroy. The images of Willis Nazrey/Daniel Payne, Elisha Weaver, and Richard Allen are from James A. Handy's 1902 Scraps of AME History.